Whenever I'm shopping in Bellingham, I always seem to end up at Old Country Buffet in Bellis Fair. For those food snobs who scoff at places like Old Country Buffet, let me ask you this, "for the price you pay at Old Country Buffet, would you rather go eat fast food?" The answer is pretty rhetorical. Of course you won't find the fancy food you'd find at Vegas buffet; but remember what you are paying. Lunch only costs $10.00 and dinner is only $13.00. For that modest amount of money, you really get a good bang for the buck. And if you have a family, Old Country Buffet offers a variety of food in a family friendly environment. Yes, even my son will find something to eat here, despite his finickiness. And what exactly are you getting? Of course there is the requisite salad bar with your choice of spring mix, romaine or green salad. There is a multitude of toppings which include broccoli, egg, peas, beets, tomatoes, cucumbers, carrots, olives, peppers, mushrooms and red onion. In addition, there are prepared salads such as bean, potato, macaroni and apple. For all the times I've eaten here, I've always been impressed at how fresh the salads are. Once you're done with the salad, there are 2 soups to choose from, usually a chicken noodle and a cream soup. Right next to the soup station is where you can make your own taco with all the fixins'. I'm sure some people love the Mexican food; but for me, it's all about the meat and I usually head straight towards that. Tonight was "meat" theme night; thus there was a selection of roast beef, turkey, ham and steak at the carving station. At the same station, you'll find pizza, baked potato and fries as well. You know, for an inexpensive buffet, the meats are quite good. I never find that I have to deal with tough meat. Other hot food includes fish, fried chicken, meatloaf, corn on the cob, carrots, mashed potatoes (with gravy) and stuffing. The food at this station is pretty standard. It reminds me of home-cooking. Nothing hoity toity here; but good down home comfort food. Then there is what I call the potpourri station where you'll find roast chicken, spaghetti with meat or vegetarian sauce, sweet 'n sour chicken, fried rice, mac 'n cheese, ribs, string beans and hot buns. For dessert, there is a selection of cakes, cookies, hot cinnamon buns, apple crisp and pie. Furthermore, there is soft-serve ice cream and all the toppings to make a sundae. Lastly, soft drinks, tea and coffee are included as well. Now I must reiterate that when we eat at a restaurant, expectations have to coincide with price and value. Obviously, Old Country Buffet is not fine dining and they never advertise to be. However, they do claim to be a family restaurant that serves up American comfort food at reasonable prices. This is especially handy when you have kids or you're just plain hungry. Especially in an economic downturn, value is often a very important factor when it comes to dining out. While dining at Ki Sushi a couple of months ago, I noticed that it was affiliated with Dragon Palace next door. To tell you the truth, I'm not sure if that was really a good thing. Thankfully, the meal at Ki Sushi was pretty good and it alleviated my initial fears. However, with a name like Dragon Palace, it conjured up images of the now defunct Dragon Inn. Was this place an actual authentic Chinese restaurant or was this a "Canadian-Chinese" joint??? I mean, was I going to find Sweet & Sour everything on their menu? Was I going to be the only Asian person eating there (like Szechuan Chongqing)? Being the curious person that I am, I was going to take the plunge and find out for myself. What's the harm? Joining me for Dim Sum at Dragon Palace was Ma (again, not my own mother). I kept repeating to myself, "I'm going for Dim Sum at Dragon Palace in New Westminster". Somehow it didn't sound right. While we were heading there, I actually wanted to change my mind and suggested we go to Richmond instead. Yes, I was so nervous about my choice that I would actually want to go to Richmond rather than New West! However, Ma assured me that it'll be okay and we made our way to 8th Street. Snagging the last parking spot in their extremely small parking lot, I settled myself for Dim Sum in New West (still sounds wrong!). Phew! There were actually other Chinese people eating there when we first entered the restaurant. That made me feel a bit better. Taking quick peeks at the food, it looked decent. Maybe I was worrying for no reason. Furthermore, there were fresh dumplings being made behind a Plexiglas viewing area. We were presented with an order sheet that had a modest selection of Dim Sum. Prices for most of the regular-sized dishes cost $2.95 and the larger deluxe items were $4.50. We started with the Vegetable Spring Rolls which came with plum sauce. That concerned me a little bit because it really should be served with Worcester sauce. It was quite crispy lacking much filling and the plate was quite greasy. Not really an auspicious start to the meal. One of my favourite Dim Sum items is the Fried Taro Dumplings. The ones here were quite large with plenty of taro and a bit of pork filling. I didn't mind these; but they were very fragile. Barely touching them would result in a total collapse of the entire thing. Being in New Westminster, I wasn't holding out hope that there would be good Shrimp Dumplings. But I got to tell you this, the ones here were more than acceptable. It's true that the dumpling wrapper was a bit doughy and thick; yet the shrimp filling was quite good. There was plenty of large crunchy shrimp and it was only moderately seasoned. Not bad, since they were large and moderately priced. The BBQ Pork Rice Noodle Roll was quite large. There was ample BBQ pork inside; however, it was a bit over seasoned. The rice noodle itself was decently soft; yet firm enough to withstand handling by chopsticks. Since they use the same meat for their BBQ Pork Buns, it is predictable that it was a bit too flavourful. A bit too sweet and salty, the filling overwhelmed the delicately steamed bun. At least the bun itself was quite soft and fluffy. I suppose in this case, over seasoning is better than being bland since the bun is practically flavourless. As per usual, whenever I go for Dim Sum, steamed Blackbean Spareribs is a must order. The spareribs here at Dragon Palace were alright. Only moderately salty, the spareribs were quite tender. However, I didn't like the relatively dominant amount of cartilage pieces. You see, these pieces are generally not easy to eat since the meat sticks to the bone. The better pieces are usually attached to actual bone. Honestly, I didn't mind eating at Dragon Palace, after all what do we expect out here in New West? The food was edible and the prices were reasonable. Service was friendly; if not a bit sparse. Now, if one was to compare the food here at Dragon Palace with the rest of the GVRD, it would not even have a chance. Put this restaurant in Richmond and it wouldn't be able to compete. Yet, by virtue of it's location and that there aren't any real competitors within a country mile, it is acceptable. While we were milling around the foyer after our Friday ice hockey game, Special K asked me if I had ever dined at Cioppino's before. As fate would have it, I had a reservation at 6:45pm to go the following night. Coincidentally, she had a reservation for 7:00pm on the same night! Right there and then, I devised a plan to take advantage of the situation. That's right folks, I have sunk to a new low. I asked if I could take pictures of their food, even though their table would likely be nowhere near mine. Prior to our dinner at Cioppino's, Elaine, Costanza, Viv an d I went to the Scotiabank Theatres to watch District 9. Let me just say that was one very odd movie. Somehow, I really was not in the mood for Prawns after watching it (if you've seen it, you'd understand). 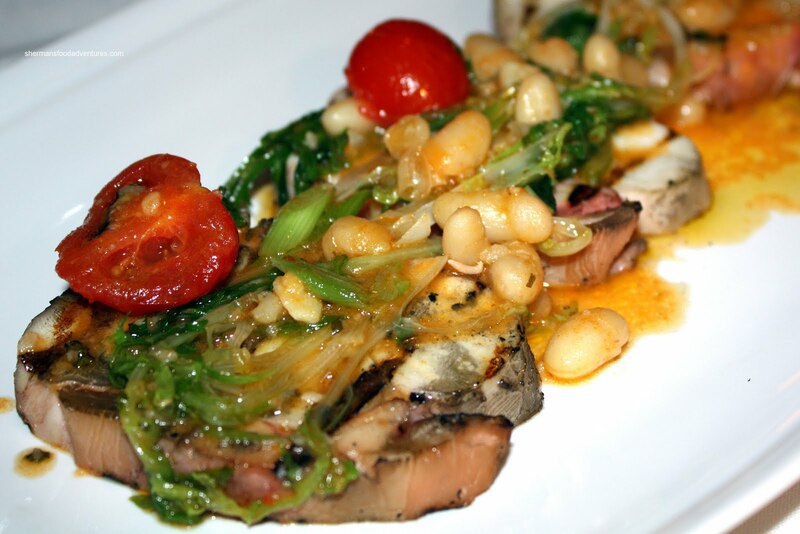 For my starter, I went for a different type of seafood - Grilled Tender Pacific Octopus with stewed Tuscan white beans. Although it was tender in some parts, most of the octopus was a bit chewy. Despite this, the combination of white beans, frisee and cherry tomatoes in a citrus vinaigrette (?) helped bring out the natural sweetness of the octopus. This ended up to be a filling appetizer and I knew right there and then that this wasn't going to be a Filet-O-Fish meal. For those who do not know what I am referring to, there is a story behind this. Once I had a meal at Feenie's (now DB Bistro Moderne) that was so small, I needed to go get a Filet-O-Fish afterwards! So from that point on, if a meal was unsatisfying, it would be deemed a Filet-O-Fish meal. Viv loves smoked salmon and it was predictable that she would choose the Apple Wood Smoked Wild Salmon with toasted brioche. The salmon was buttery soft with gentle smoke undertones. The sweet toasted brioche provided a nice textural contrast. The sauce (looked like olive oil, mustard and shallots?) 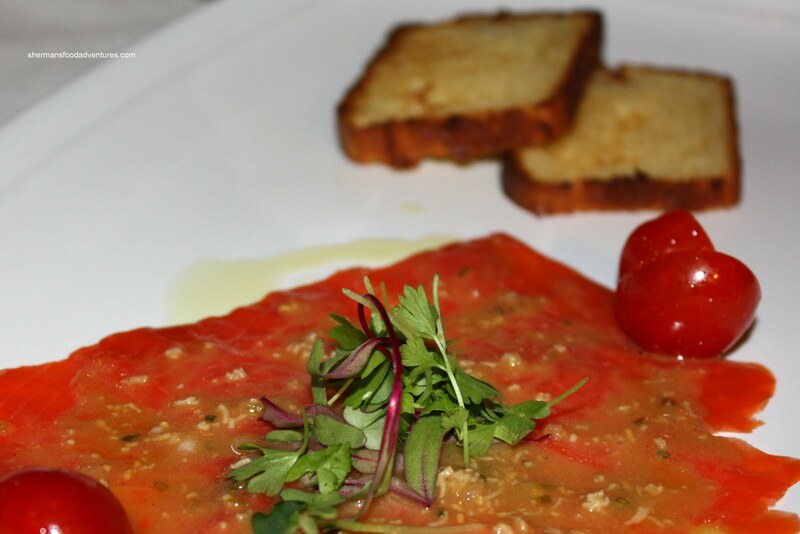 added a nice smoothness to the salmon without interfering with its delicate flavour. Elaine went for something completely different and bless her soul for doing so. More diversity for me to write about! 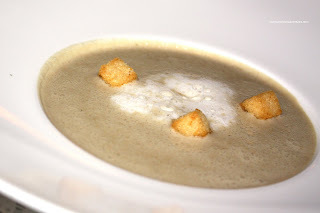 Her choice of appetizer was the Porcini and Chestnut Soup with vanilla chantilly. This particularly soup was a Gold Medal Winner. When I think of chestnuts, I usually equate it heavy and hearty. Yet, one sip of this soup and I was pleasantly surprised by its lightness and depth of flavour. Thanks to the porcini mushrooms, there was a nice combination of earthiness and richness which was never heavy. I didn't get to sample the Chantilly on top of the soup; but I'm sure that it would have added an extra creaminess. Costanza dined at Cioppino's recently and had sampled a dish with an exquisite balsamic dressing. He asked our server if they could whip something up using the same vinaigrette. The kitchen obliged and a simple Spring Salad with feta arrived. Honestly, the salad itself was none too exciting. Mind you, the kitchen could only do what it could with the special request. I must remark that the dressing was indeed very good since it was super smooth with only slight balsamic undertones. A less successfully executed dressing would've been sour. Thankfully, Costanza's main dish had much more substance. He opted for the Veal “Ossobuco” alla Milanese with saffron risotto. Looking quite rustic, the large portion of veal rested on a modest amount of risotto. The veal was super tender and delicately seasoned. Prepared much like a pot roast with root vegetables, there was a richness to the meat from the slow cooking. 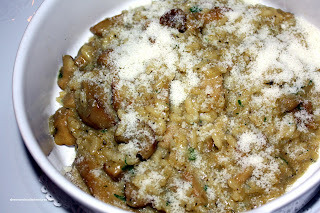 The risotto had a nice firm texture and it held up well to the addition of the roasting juices from the veal. Of course the real draw of osso buco is the bone marrow and Costanza devoured it all by himself. I originally had difficulty selecting my main dish since I am conflicted when there is so much choice. 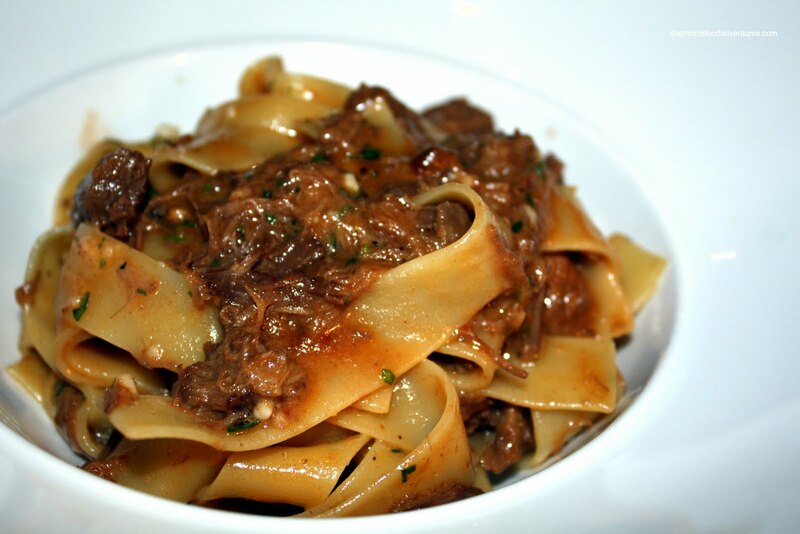 Thankfully, Costanza recommended the Pappardelle with 4-hour-braised veal cheeks and porcini mushrooms. He had this dish on his last visit and swears by it. The first thing that I noticed was how the pasta was so perfectly cooked. It was teetering on the line between undercooked and just cooked. To me, that is perfection. 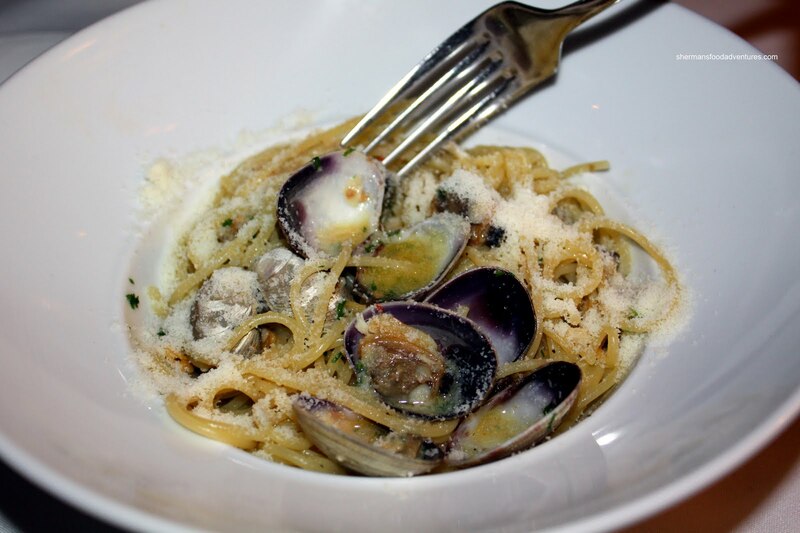 The pasta is soft enough to eat; yet still retains bite and/or resistance. With just enough sauce clinging onto each ribbon of pasta, the flavours really worked. The slightly nutty flavour of the porcini helped offset the saltiness of the tender pork cheeks. It's one of those dishes where you would keep eating it if there was an unlimited supply. Viv picked another one of her favourites, the Braised Beef Short Ribs in red wine with seasonal vegetables. Sandwiched in between 2 "interestingly" shaped mounds of potato puree were 2 melt-in-your-mount pieces of short rib. There was a pronounced red wine taste to the ribs and sauce. Some nice broccolini finished off the dish. Now, I've saved the best main course for last. 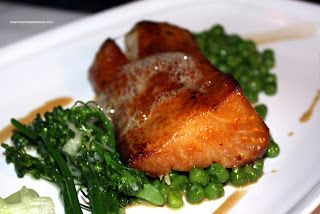 Elaine smartly chose the Pan-Roasted Sablefish Fillet with soy sabayon and green vegetables. Apparently, this was one of the dishes Pino served at the James Beard Dinner in NYC. After trying it, we could see why. The fish was prepared to perfection with each moist flake of fish melting in our mouths. Flavoured with a soy sabayon (which is usually a dessert), the fish w as well seasoned; yet there was no question it was the star of the show. Some may wonder why this dish costs $40.00. The answer to that is if you even had eaten something that you can remember for a long time and still taste it in your mouth through memory alone, it was worth it. For dessert, I ended up with the Limoncello Cheesecake with citrus-vanilla confiture, aged Balsamico caramel and mascarpone-citrus sorbet. 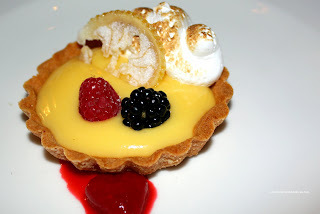 Once again, this was served at the James Beard dinner in NYC. I didn't know this before ordering it and I ca n see why it was chosen for the prestigious dinner. The soft, sweet and fluffy cheesecake was perfectly contrasted by the crunchy citrus rind shavings sprinkled on the outside. It gave an extra kick of flavour and tartness/bitterness to the delicately sweet cheesecake. Further enhancing the tartness of the dessert was the mascarpone-citrus sorbet. I thought that the mascarpone helped temper the tartness by offering a smoothness normally associated with gelato (despite this being a sorbet). Giving one last kick of sweetness and depth was the balsamico caramel. 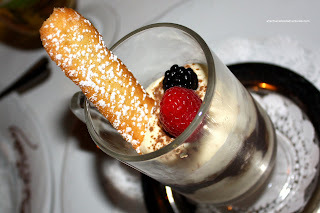 Elaine had the Tiramisu with mascarpone custard, lady fingers and chocolate sauce. I love tiramisu and almost ordered it instead of the cheesecake. I got a good spoonful and it was delicate and only moderately sweet. There wasn't a pronounced coffee flavour. It was there, we could taste it; but it didn't dominate the dessert. Viv opted for a decadent dessert in the form of the Light Milk Chocolate Mousse with raspberry cream centre, sour cherries and mango coulis. 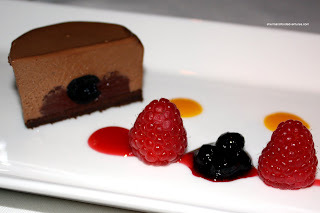 Colourfully presented on a long white plate, the chocolate mousse melted in my mouth. A s the name implied, the mousse was rather light and only semi-sweet. The raspberries and coulis added a nice tartness to the mousse. 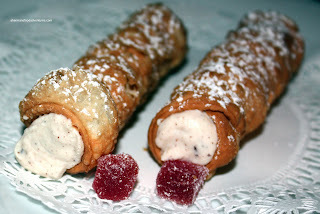 Costanza was intrigued by the Ricotta-filled Cannoli which was the dessert special. He thought they were a bit heavy and I would have to agree. Probably the weakest of the desserts we had. I did like filling though, it was light and creamy. Now normally I would have pretty much summed up my thoughts and begin to do a concluding paragraph for this post; however, with Special K and Emilicious dining across the room, I couldn't pass up the opportunity for more pictures. In between our courses, I passed the camera to Special K and she graciously took pictures of all dishes at her table. Yes, I knew someday that I would sink to this level where I would have pictures from a table that I was not even sitting at! Their party started off sharing 2 appetizers. The first one was the Sautéed Calamari “alla Ligure” with spinach and Portobello mushrooms. I was told that the Calamari was tender and of course delicately seasoned. I considered it, but I think it would've been bad etiquette to start trying dishes from another table. Maybe I'll sink to that level one day. The second appetizer was the Crepes with buffalo mozzarella. According to Special K, the crepe was very tasty, it had a delicate flavour, definitely French influenced. There was a dinner special which was a Risotto with Italian Truffles. It sounded really good until our server notified us it would be $100.00. Apparently, Special K and Emilicious had the same reaction too. 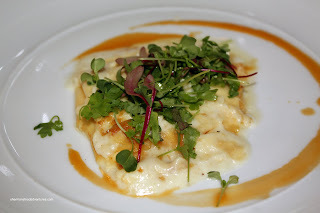 So no comments on Truffle Risotto here, we'd like to eat for the rest of the week! Instead, their table had the Porcini Mushroom Risotto. Special K thought the risotto was really good. It was cooked perfectly and it was not too rich. Sometimes risotto is heavy-handed with a thick consistency, but this was just right. They also had the same pappardelle that I had and Special K thought that it was everyone's favourite. The veal was so tender and full of flavour, hardly needing any sauce. 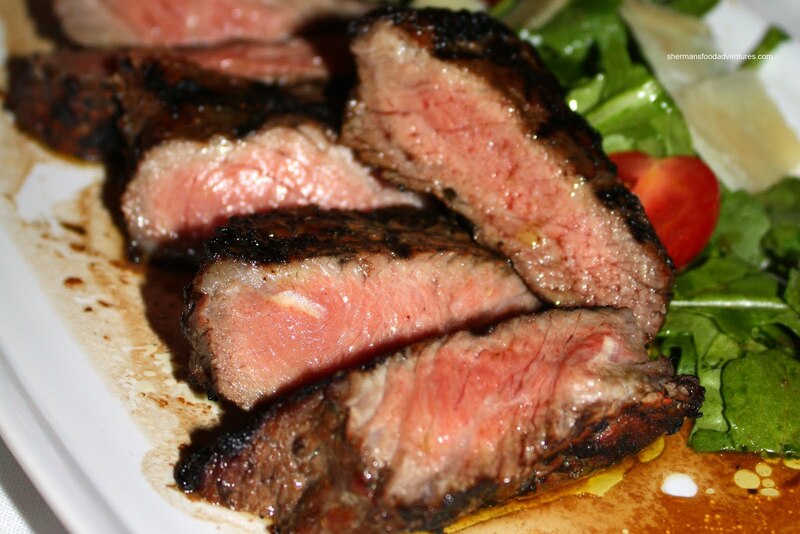 Special K normally prefers beef tenderloin, but decided to give the Tuscan Rib-Eye a try. On the menu, it's described as the Tuscan style rib-eye of dry-aged triple A beef with rocket salad and Parmigiano. She thought the meat was cooked perfectly medium/medium rare and very tender. It was a large piece of meat, but they balanced it very nicely with a green salad and balsamic vinaigrette. For me, by looking at the dish, the beef seems to be cooked perfectly and evenly with a nice char on the outside. 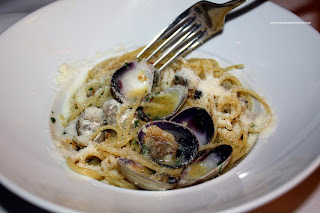 Emilicious seems to love pasta and clams, so it wasn't much of a surprise that she ordered the Spaghetti “alle Vongole” served in a white wine garlic sauce. According to her, it was very well done. Not as in overcooked but perfectly al dente tossed in a white wine garlic sauce - very simple and delicious. She added some crushed chillies for a bit of a kick as well. When I went to pick up my camera, they kept "ooo"ing and "aaa"ing about their Organic Lemon Tart. I'm sure they said "organic", not some other similar word... Emilicious thought the lemon filling had a good consistency and tartness to it. It was topped with a light and fluffy meringue that had just the right sweetness to offset the tang of the lemon. Crust was thin - good balance of crust to filling. Special K liked the tart, but she preferred the Tiramisu. It's true that Cioppino's is pricey and it's very easy to drop $100.00 per person, if not more for a meal here. However, in my opinion, it's one of those dining experiences that is worth every penny (and that's a lot of pennies). 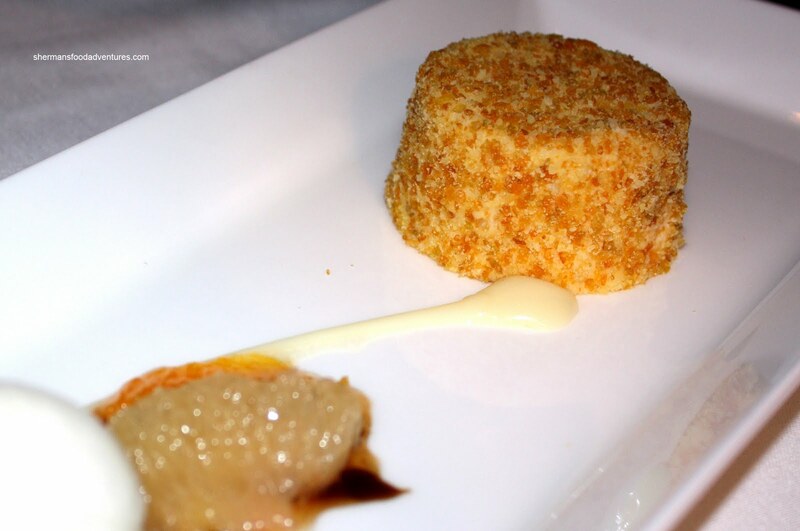 The food in general was executed with precision and care, sometimes by Pino himself! Nice to see an Executive Chef in action rather than merely supervising. Service was professional and not pretentious in any way. The ambiance was a bit noisier than I expected; but it didn't detract from the overall experience. 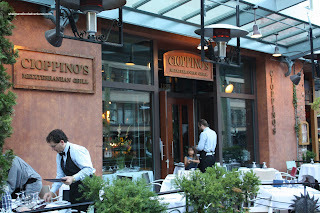 Cioppino's is definitely high on my list of "must eats" in Vancouver.